Maternal antibodies circulate in the newborn's blood for a number of weeks. There is a period during which time the maternal antibodies are too low to provide protection but too high to allow the vaccine to work. This period is called the window of susceptibility. This is the time when despite being vaccinated, a puppy or kitten might still contract a disease. It is quite possible that high levels of maternal antibodies will block the effectiveness of a vaccine and vets therefore recommend multiple initial vaccinations. The vaccine will only work once the level of maternal antibodies has dropped to a low enough level. The length and timing of the window of susceptibility is different for every litter and even individuals in a litter. Research has shown that at 6 weeks 25% of puppies could respond, at 9 weeks 40% and by 16 weeks this increased to 60% and by 18 weeks nearly 95% responded by developing new antibodies after being vaccinated. Second vaccination given at 10 - 12 weeks. This is another 5-in-1 and if the puppy is 12 weeks old the first Rabies vaccination can be given. Third vaccinantion given at 14 - 16 weeks. This will be the last 5-in-1 and the first or second Rabies vaccination. If it is the first Rabies vaccination the puppy will require a booster in one month's time. For both dogs and cats it is recommended to have vaccinations every 1 - 2 years after the primary vaccinations. Parvovirus (also known as Cat Flu): This is a very common viral disease. It is deadly and usually strikes young puppies. It spreads by infected dogs’ blood, stools or vomit. When the disease first appeared it was believed to be transmitted from cats to dogs and hence the name cat flu, however, this was proven NOT to be the case and dogs do therefore not contract catflu from cats. Symptoms include severe diarrhoea, fever, chronic vomiting, loss of appetite and dehydration. This is probably the most critical first puppy vaccination. It is often fatal despite aggressive treatment and too often seen by vets. Calici virus and feline herpes virus cause upper respiratory (nose, sinuses and windpipe) signs such as nose and eye discharge called Rhinotracheitis. This is also commonly known as 'snuffles'. The Calicivirus can also cause ulcerations on the tongue. The biggest concern with these two diseases is that they cause loss of appetite and dehydration in young kittens. Some people may think that vaccinating a pet is waste of time and money. Hopefully you have now seen that it is completely the opposite. Vaccinating from a young age can prevent serious diseases (costly and not always successful treatment) and heartache when a precious puppy or kitten passes away. After the initial 3-4 vaccinations, vets recommend that pets are vaccinated on a yearly basis. There has been research done that might suggest that every 3 years would also be sufficient, but if you count each animal year as 7 years, this will be the human equivalent of only seeing your doctor every 21 years. 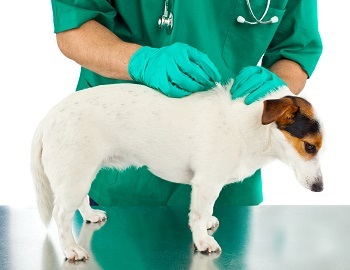 Your pet's annual shots do not only include an injection, the vet should also do a complete general check-up. This includes checking your pet's teeth, coat and eyes, listening to the heart and lungs, checking for lumps/bumps and feeling the abdomen. The vet should also ask you about your pet's general well-being. Questions regarding water intake, appetite and frequency of urination are important. Your vet should also look at your pet's stools. This general check-up becomes increasingly important for pets older than 7 years – these guys are regarded as our senior members. The cost of a yearly vaccination/check-up is a small price to pay to keep your pet in good health for as long as possible.